Not only is it perplexing when your hamster chews her cage bars, but this nocturnal creature often inconveniently interrupts your sleep with her bad habit. 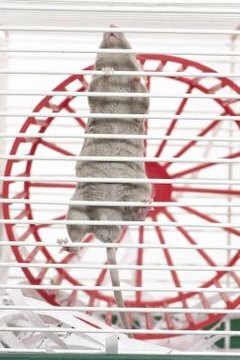 Understanding the reasons why hamsters exhibit this behavior and providing alternatives will remedy this undesirable situation. Whether an old habit or a new one, encourage your hamster to stop chewing the cage bars. Hamsters have teeth that will continue to grow over the course of their lives. Your hamster will naturally chew to wear down her teeth, and this means gnawing at the cage bars if there is nothing else available. Make sure to provide plenty of alternatives on hand. Chewing toys are available at pet supply stores, specifically untreated wood. Cardboard can also be found in the home, such as toilet paper and paper towel tubes. For a hamster who prefers the taste of the metal bars, give her a stainless steel teaspoon. Your hamster may chew the bars if she is hungry though hamsters should never be left without food. Keep a pellet mixture in a clean dish available at all times, containing grains, seeds and dry vegetables, like corn and carrot. To wean her off the cage bars, place a fresh piece of crunchy fruit or vegetable, such as an apple, in between the bars of the cage as long as it does not create additional space to provide her with an easy escape. Remove any uneaten fruits and vegetables before it spoils. Just like humans, hamsters can become bored and need to release pent up energy. If left alone, she may enjoy filling the silence with the sound made from chewing on the bars. Especially when you are not at home, let your hamster exercise on a running wheel with a solid surface. Otherwise, give her positive attention more frequently, not just in response to her chewing, to focus her energy elsewhere. Aim to interact with her at least once each day. Also try to purchase or adopt more than one hamster, preferably of the same gender to prevent breeding, so that they can give each other constant companionship. Move the cage to an area where any chewing will not disturb you, whether your hamster chews the bars or toys. Likewise, keep the cage in an area where daytime activity won't keep your hamster awake as this will stress her out too. Should the bars wear down, consider replacing the cage for a 10-gallon glass tank with a screened lid for air flow. Can Gerbils Have Cardboard in Their Cage? What Items Do You Need for a New Hamster? What Do Hamsters Like to Play With? What Happens if You Feed a Hamster Too Many Vegetables? What Can Be Put in a Hamster's Cage to Keep His Teeth Down? What to Do When Your Rabbit Suddenly Wants to Chew Everything? What Kind of Wood Can I Use for My Hamster?